Volunteerism is a topic of increasing importance in this age of budget cuts, declining employment and amid the threat posed by other competing leisure pursuits. There are both social and economic benefits of volunteering. As we are becoming more reliant on volunteers, there is a need for a better understanding of why people take up volunteering, and how to recruit, manage, motivate, and support volunteers most effectively. In order for organisations that host volunteers to achieve the most from their volunteers, they must understand how to give them the best "leisure" experience. 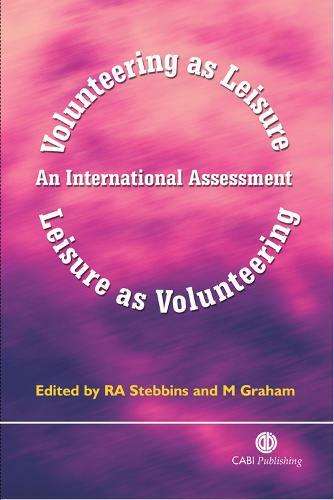 This book examines critical aspects of contemporary volunteerism, from the perspective of a variety of volunteering contexts. It will appeal to academic researchers and students in disciplines such as leisure, recreation, tourism, management and sociology as well as practitioners in the voluntary sector (including volunteers), National and Local Government and those organising special events that depend on voluntary support.